These are the 8 finished projects that I have photos of. I also completed a vest for a friend's grandson, crocheted a sweater that I need to send to a friend, started and worked on some socks that aren't completed yet and did do some spinning (not as much as I would have liked). 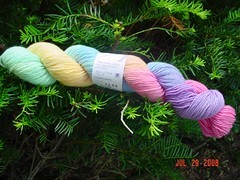 I was lucky enough to go to SPA, Conn Sheep and Wool, NH Sheep and Wool and Stitches East. It has been a good year for fiber. 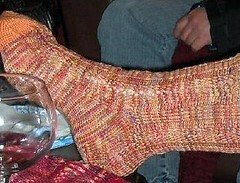 Hopefully in 2010, I can keep up with projects, finish a pattern I am writing and attend some more super fibery places. Hope everyone has a great year and you accomplish everything you want and then some. Last weekend as you know, we attended SPA. 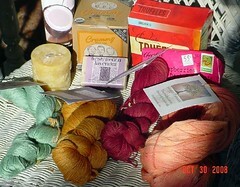 There were lots and lots of yummy fiber, yarn, goodies, some spinning wheels, patterns and books. I actually purchased one cone yarn but lots of fiber, lots and lots of fiber. Now not all of it was for me, well most of it was for me, but some was for Mary’s swap pal, my swap pal, my sister’s swap pal also received something. I bought some yarn for my mom and my sister and Mary bought some yarn. I bought some black Icelandic lamb roving, some smokey gray bamboo roving, some tencel/merino roving from Spunky Eceltic spinning, a gray and cranberry roll and some other items that were just too pretty to leave behind. Now to just decide what all of this should be. Hmmmmmmm that will have to wait, I still have to finish my swap pal’s socks. Then – more spinning. This past weekend friends and I held our second silly sock swap. Now this time it really was silly. My sister had me as her pal and with one thing and another didn't have time to finish my second sock - for either of the socks that she has made me in the past year. 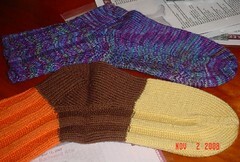 The brown, orange and yellow is sea silk and is my single sock from last Christmas. The purple one in the back is also a silk blend and is done in the Eagle Flight pattern (with modifications) and that is my sock for this swap. Now she has already started both of the mates to these socks so I am anticipating getting a pair or two for the holidays. Until then, I will wear both proudly and drive her OUT of HER MIND. Her OCD will kick in big time and will motivate her to knit faster. HEHEHE Love being evil. She also gave me a yummy Inca Alpaca in a purple heather, dark chocolate with carmel, dragon fly stitch markers some mystery sock yarn and the Yarn Harlot's newest New York Best Selling book. Great swap. 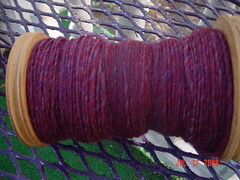 This is the first bobbin full of the yarn that I am making for my swap pal. 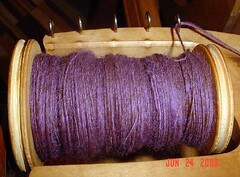 I will be spinning the second bobbin this weekend and hope to have it plyed up the beginning of the week. I would like to send it out the end of the next week. I am going to have to look for some goodies to put in the package as well, as the other 4 ozs of unspun fiber that I am sending. I am sooooooo excited about this swap. I can't wait until I get my package from my swap pal. More updates as I spin and shop. They are finally finished. 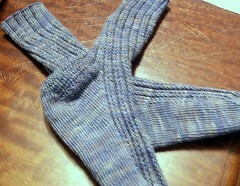 These were socks for a friend for a swap that we are doing and I have finished them....YEAHHHHHHH. They were a fun knit even if I did read the pattern wrong. I thought it was a two row repeat....no... 1/2 through the 2nd sock when I was getting ready to do the heel flap I noticed that the 3rd row was NOT the same as the 1st row as I thought it was it was different....but hey they are great looking and I am pleased and I hope that my pal will be too. We are getting together on Sunday night and doing our swap so I hope to have photos on Monday of the loot, swag, I mean gifts that we receive. Have a great weekend and stay dry.